Jordan Spieth hugs his caddie Michael Greller, left, after winning the John Deere Classic golf tournament at TPC Deere Run in Silvis, Ill. Spieth defeated Zach Johnson and David Hearn on the fifth hole of a playoff. TACOMA, Wash. | He’s the kind of guy who could strike up a conversation with anybody. Call it a cool confidence, if you’d like. Perhaps gregarious. Or outgoing. Whatever the case, it has paid off for MOC-Floyd Valley High School and Northwestern College graduate Michael Greller. 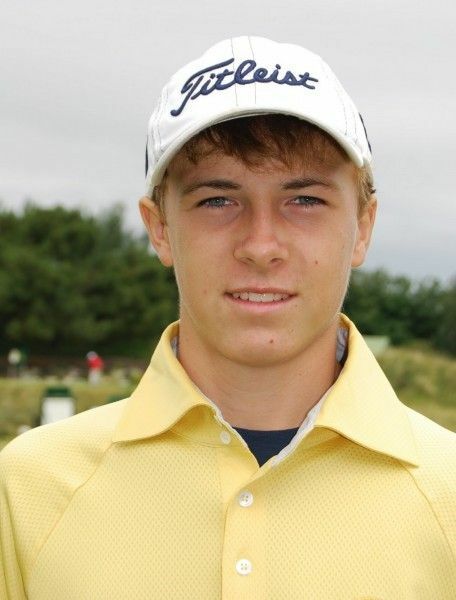 It started back in high school, when while working at Landsmeer Golf Club in Orange City, Iowa, he challenged head professional Mike Fiddelke to a match and beat him. Greller went on to enjoy success as a collegiate golfer, toiling as the No. 2 player for Northwestern College teams coached by Dave Mulder and Mark Bloemendaal. Through his ties in golf, the 35-year-old Greller eventually walked away from a 10-year teaching career to become a caddie. He’s now working full time for PGA Tour rookie sensation Jordan Spieth, who earlier this month at 19 became the youngest player to win an event in 82 years. Spieth’s victory in a five-hole playoff at the John Deere Classic not only earned him full status on the PGA Tour, but a chance to compete in the FedEx Cup Playoffs. He just returned from a 44th-place finish at the British Open and will play in the PGA Championship in a couple of weeks. How Greller came about becoming Spieth’s looper is a story worth retelling. A Michigan native, Greller moved to Orange City in 1992 when his father, John “Bear” Greller became vice president of development at Northwestern. Michael graduated from MOC-Floyd Valley in 1996 and Northwestern in 2000, earning a bachelor’s degree in business. He migrated to the west coast, settling in Oregon where he worked in sales for a year. Spieth turned professional in December and joined the PGA Tour with no exempt status. My, how that has changed. He’s currently 18th on the money list with earnings of $2,058,820 and 11th in the FedEx Cup standings. Greller, though, was about as far away from carrying a bag as anyone when he attended the 2006 U.S. Amateur Public Links at his home course, the Olympic Course at Gold Mountain. By then, he was a sixth-grade math teacher in Tacoma, simply following the featured group that particular day. Savage, a Florida State University player, shot 75 while toting his own bag but with Greller in tow rebounded for a 69 the following day to make the cut and advanced all the way to the match play quarterfinals. As much as he enjoyed his first experience as a caddie, Greller still had an everyday job and returned to teaching. He did, though, carry bags during the summer months. He changed teaching jobs in 2007, switching districts in order to be closer to Chambers Bay, a newly opened course that was to host the 2010 U.S. Amateur. “About a month before (U.S. Amateur) I called Matt and asked if he knew anybody who needed a caddie,” Greller said. “He connected me with Justin Thomas, who at the time was 17 and hadn’t yet broken out on the amateur scene. He’d finished runner-up in the U.S. Junior Am in Michigan and fired his caddie. Thomas and Greller would pair up for three U.S. Amateurs, the last being in 2012 at Cherry Hills in Colorado, where Thomas advanced to the semifinals. The Junior Amateur, for golfers 17 and younger, came to Gold Mountain in 2011. In the field was Jordan Spieth, the nation’s top-ranked player. Greller had already committed to Gavin Hall prior to the tournament, but Hall injured his wrist and withdrew and Greller needed a loop. He called Thomas, who hooked him up with Spieth, and the two hit it off immediately. The team of Spieth and Greller went on to win the U.S. Junior title that week. Despite their success, and his ongoing run with Thomas, Greller was still a school teacher. But through the urging of his girlfriend, Ellie Morris, Greller started thinking more about becoming a professional caddie. Both Spieth and Thomas made offers to Greller to caddie for them at the 2012 U.S. Open. Greller carried for Spieth at the Olympic Club in San Francisco and Spieth finished as the low amateur, tied for 21st overall. When Spieth turned pro late last summer and came calling for a full-time caddie, Greller accepted the offer. He quit teaching in December and in Spieth’s first event, the Farmers Insurance Open at Torrey Pines, they missed the cut. They tied for 22nd at Pebble Beach (AT&T Pro-Am) and in March, Spieth broke through with a runner-up finish at the Puerto Rico Open. He recorded two more top-10 finishes over the next month, earning enough money to make him a temporary member of the PGA Tour. 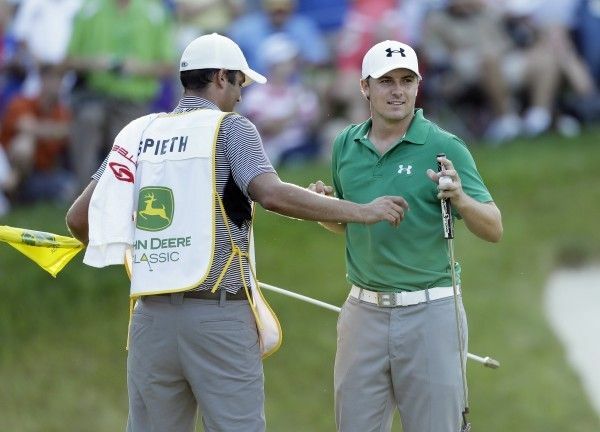 At the John Deere Classic, Spieth entered Sunday’s final round six shots behind the leader. He holed out a 44-yard shot from a bunker on No. 18 to force his way into a playoff, then beat Zach Johnson and David Hearn on the fifth extra hole. “When that shot went in, we blacked out for a second. There was a lot of laughter that day,” Greller sasid. “We like to rip each other out there, keep each other grounded. I talk to him like I would talk to my brother. Even when that bunker shot went in, though, I didn’t think we were going to win it. Greller said that despite his tender age, Spieth does a good job staying grounded. “Aside from a world class talent, he’s a world class worker,” Greller said. “After winning, he is telling me we have to look to the future and it’s good to have your boss telling you that. An event just a bit more pressing than carrying a golf bag, figuring out yardages and discussing wind direction will keep Greller away from golf for a couple of weeks. He and Morris will be married on Saturday, ironically, at Chambers Bay. The Greller-Spieth duo will convene again for the PGA Championship Aug. 8-11 at Oak Hill in Rochester, N.Y.
That will be their 20th tournament since early February, counting two Web.com events and 18 on the PGA Tour, and Spieth has made 15 of the 19 cuts. Spieth, who turned 20 on Saturday, could have chosen a more experienced caddie for his first season. Greller, of course, had plenty of practice in that field. Tax Day. I suppose it's an appropriate time, tongue in cheek, to write about Michael Greller.